While many are hopping off their bikes as temperatures drop and drizzles descend, fall is actually a stunning time to ride. And with so many companies now offering stylish options, it’s easy to stay dry, warm, and still look your best. Read on for this fall’s latest cycling fashion. Turning miserable slosh-fests into enjoyable rides can be as simple as putting a lid on it. We like to start with a helmet that doesn’t have ventilation like the ultra-modern, super-minimalist Sahn Helmets. For more warmth, style, and helmet-head coverage, we throw a cap on too. We love Vulpine’s Thermal Storm Cap, which has futuristic colors and huge reflectivity to make cycling safe and attractive. For easy city commuting and heritage style, try the Spirit. The Storm Cap offers a fleece thermal lining for extra comfort, and will fit under most helmets. A great pair of pants that moves easily from bike to life has long been elusive, but this season things have become easier for us all. For cool-weather cycling, we look for dark colors in hardy materials. Unlike summer, where sunny days leave white shorts unmarred, the rain and muck on city streets in fall can ruin an outfit in moments. 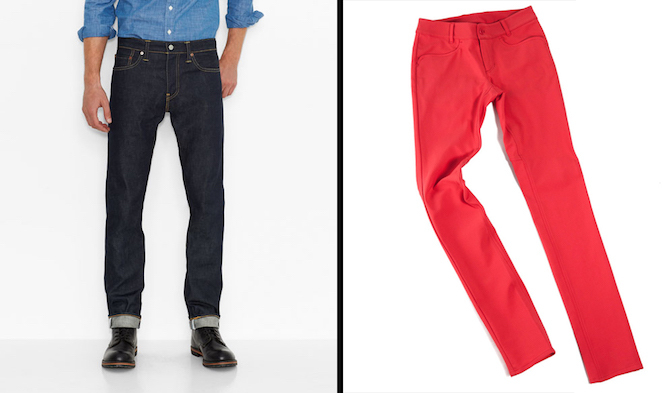 Levi’s hit the market this season with even more men’s stylish, yet functional pieces made to cycle. The comfortable stretch denim, modern below-waist fit, reflective outseam, and classic waistband u-lock storage keeps these pants looking fresh on and off the bike. Levis and Outlier both offer fashion forward pants that are made for cycling. Outlier’s Daily Riding Pants are our choice for women. The four different colors -- including a festive vibrant red -- mixed with technical, stretchy fabric make these perfect for drinks and the ride home. Made in New York and adherent to Bluesign environmental standards, these pants are a USA-made, eco-friendly option too. The majority of wind and rain falls on our shoulders and back, which makes a windproof, waterproof, and fashionable jacket a necessity. When choosing coats, we look for a sleek, tailored fit that won’t flap in the wind, weatherproof technology, and hits of reflection that can be hidden after a ride. 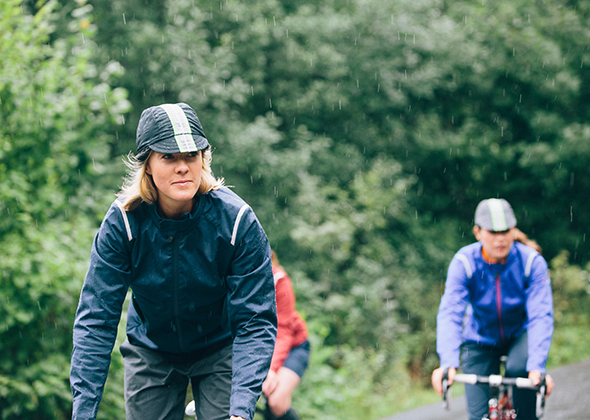 New this fall is Arc’Teryx’s impeccable line of urban cycling wear. Their A2B Commuter Jacket is a perfect blend of all of our requirements: it’s fashion forward, tailored, weather resistant, and transitions easily from commute to street. Some of the details include integrated reflectors on the cuff and collar that tuck away and a zippered back pocket that simply make sense on a bike. Seattle-based Hub and Bespoke has a sophisticated, lady-like option for women. 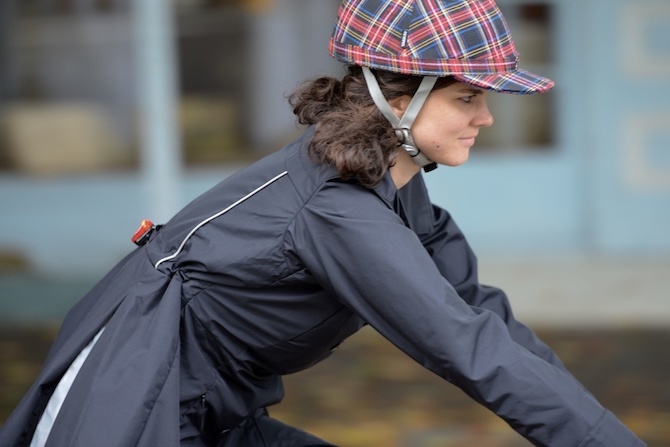 This waterproof, ultra reflective, and stunningly elegant Riding Coat flounces out at the waist for a feminine fit. The ample reflective hits at the back, zippered chest vents, and massive collar make this jacket perfect for foul-weather commutes. The Riding Coat’s reflective features are subtle when not in use, and there’s even a rear loop for tail light attachment. Fall riding should be toasty from top to bottom, so you aren’t complete without proper footwear. Casual and hyper-technical style has run the cycling community for years, so we were thrilled to find stunning, high-end pieces on the market this season. Women can finally wear a heel while cycling with the Tracey Neuls cycling shoe. In Bike Reflector Grey, these chic ankle boots feature a hit of reflective at the back and a rubber sole that is practical for daily rides. For the men, we’ve fallen in love with DZR’s Marco Black. They call these the world’s first bike polo shoe, but we have to say that this SPD-compatible style has sleek urban cred that would fit in at a casual office and a night out. DZR’s Marco Black bike polo shoe offers high performance and style in one package.